Any news media story that covers furries is likely to focus heavily on fursuiters, and their striking visual appeal and fuzzy glamor. Fursuiters can’t represent the whole of furry fandom, when “furry” is a vague and broadly defined umbrella over anything related to anthropomorphic animals- but I think it’s OK to consider fursuiters the expressive, theatrical soul of furrydom. There is an element of “ambassador” role to their hobby. Without the 15-20% of furries who wear fursuits and costumes for role-playing, you’d just have regular unglamorous nerds saying “meow! I’m a cat”. That’s what crazy people do. Of course, I’m kidding: Call me the most crazy of all, but I prefer the term fabulous. I like to put on silver disco pants and a Husky partial, and get on the subway to go dance and hug random people, under the influence of blasting techno music and magical substances in the air. They get so entranced by a giant sparkly talking dog, that they hand over their babies for photos. That actually happened several times this weekend at the How Weird Street Faire. I didn’t know where those babies had been, but I let them touch my paws anyways, even more carefully than when I pick up my chihuahua (who gets super confused and never knows whether to trust me when I dress up.) As far as I can tell, everyone loved the experience, even the astonished babies. Those photos might provoke some interesting questions when they grow up. I’ll let you argue for your preferred furry experience, but street fursuiting is mine. I’m shameless for performing to surprised and delighted members of the largely uninitiated public. It never fails to arouse curiosity, turn heads, and invite photos, dancing or hugs. Some may yell out “Furries!” and a few may confuse it with the word “Plushie” (a different species, that I suspect is more of a dated media creation than a self-applied label these days). There will also be some “phwooooar!” reactions, prurient interest, shock, or “I’ll-just-pretend-that-didn’t-walk-past” constipated expressions. This kind of casual street theater seems to go over with overwhelmingly positive response in San Francisco. Here, Improv Everywhere’s annual No Pants Subway Ride is a thing, and it’s no surprise when I pass a man wearing little more than a bridal veil and nun makeup on the way to work in the morning. Furries are an acceptable part of the landscape. “Is that a costume, or is that how you always dress?” is a legitimate question in San Francisco. I can’t tell you the number of times I’ve thought that question when I look at a fellow passenger on the bus or a group of people walking down the street. Even with the prevalence of outlandish fashion in this city, fursuiters stand out as more glamorous and head-turning than most any other sight. Street fairs are a perfect occasion for them. There’s an ethusiastic audience of packed crowds looking for fun, a relaxed-social-rules festival atmosphere, and a progressive urban community that blocks off streets to make a place for the energy. Compared to furry cons, there’s no expectation for a predictable furry presence, and it creates a special kind of surprise. I can’t say enough about the positivity of furry cons and their strong growth in the past decade or so, as a real-life social glue for a largely internet-based fandom. But they are a safe and planned space that can bring to mind criticism I’ve heard about cliques and pre-fab experiences. Street fursuiting can bring extra spontaneity. The street fair season is here, and I’m excited for it. 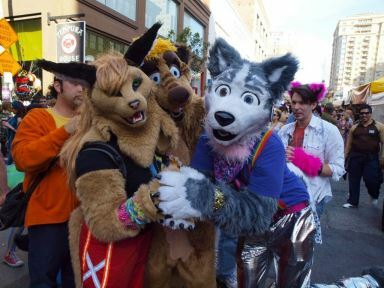 Fursuiters will be present at upcoming events around San Francisco, including SF Pride 2013 (AKA “gay christmas.”) Last year’s was a blast. But unpredictability also brings risk for fursuiters in the spotlight, especially from overly friendly or even aggressively drunk people. Good handlers are valuable. That comes up in conversation on a Fur Affinity journal posted by Samoy Wolf, another fursuiter who brought the magic with us to How Weird Street Faire, and the previous week’s outing to the Cherry Blossom Festival.